On 13 April 1943 Nazi Germany announced that it had found the mass graves of thousands of murdered Polish Army officers. They were buried in a forest at Katyn, near Smolensk, in German occupied Russia. The Germans blamed the Bolsheviks for the crime. The Soviet Union immediately denied all responsibility for it and accused Nazi Germany of carrying out the atrocity. The Polish government-in-exile in London asked the International Red Cross to investigate. This was supported by Germany but opposed by the Soviet Union. The Red Cross declined to investigate without the support of all the interested parties: the Soviet Union, Poland and Germany. The Soviet Union invaded Poland on 17 September 1939 and it sent the Polish Army officers, Police officers and leading intellectuals it captured to three special camps at Kozielsk (Russia), Ostashkov (Russia) and Starobelsk (Ukraine). Another survivor of the Kozielsk camp said that the authorities task of "re-educating" the prisoners was complicated by the strong religious beliefs that they held. In the spring of 1940 the camps were wound up. From early April until May groups of prisoners were removed from the camps on an almost daily basis. At the Kozielsk camp the first group of men was sent away on 3 April 1940. They travelled by train from Kozielsk to Gniezdovo railway station near Smolensk. The prisoners were then taken to Katyn forest, 3 kms west of Gniezdovo, shot and thrown into the mass graves. In 1971 the Katyn Memorial Fund came into being. This fund was charged with the task of designing a memorial to the Katyn dead, raising funds and finding a site in London where it could be placed. 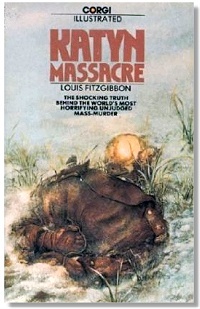 The author of the Katyn Massacre, Louis Fitzgibbon, was asked to become Honorary Secretary to the Fund's committee. An obelisk with the words "Katyn 1940" was eventually placed in Gunnersbury Cemetery, Hounslow, London on 18 September 1976. Publisher - Published by Corgi Books, London, in 1977. The book is a compilation, with some additional material, of two previous books by the author: Katyn - A Crime Without Parallel (1971) and The Katyn Cover-Up (1972) both published by Tom Stacey. FitzGibbon’s Katyn mission was twofold: to achieve a Soviet admission that it was they and not the Nazis who had murdered the Polish officers, and to establish a site for a London memorial to the dead. The latter was achieved in 1976, the former had to wait until the early 1990s, when the Russian authorities finally admitted responsibility...FitzGibbon’s campaign for a monument to the victims in London achieved a conclusion when a black granite obelisk was unveiled in Gunnersbury Park, West London, in September 1976. Its inscription, “Katyn 1940”, anticipated by some years the eventual Russian admission of the truth. This page was added on 10 September 2009.